Baahubali The Beginning is a benchmark for Telugu cinema industry on Indian screen. The film has taken the standards of filmmaking to a new level. And, the second part of the movie is being planned now in a big manner. The sequel shoot already started and is progressing at a brisk pace. Interestingly, the main climax part shoot is in progress now, and it is a big war sequence. This war scenes in the second part are more prestigious that they did in the first part. Almost all the actors had to participate in the war scenes for which everyone has undergone a one-month training. Prabhas, Rana, Tamannah and Anushka underwent training in Sword Fight, horse riding, and other war-related activities. On her Twitter profile, Tamannah Bhatia introduced her new friend and much to the surprise it is a horse with which she trained for the war sequences. The name of the horse is Pooja. 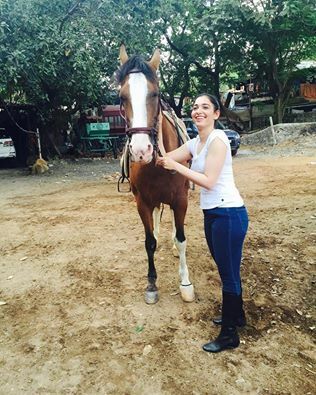 “Meet my new friend #poojathehorse #horseriding lessons @baahubalimovie, she’s a beauty” the actress posted.